Extreme poverty is a treacherous demon; far uglier than poverty, in many ways. Not only do victims fall far below the poverty line, (however you choose to define it) they are also trapped in regionally vulnerable pockets, without access to micro finance, largely neglected by government social protection programmes and NGO outreach, cut off from elite power structures which might have given them the chance to raise their voices and demand their rights. Extreme poor households exhibit a high degree of chronic and severe deprivation. Their low income is linked to a lack of employment and secure shelter, low literacy, inaccessibility to basic services, low community involvement and limited participation in decision-making. The elderly, the disabled, female-headed households and minority groups are disproportionately high among the extreme poor. There are two official poverty measures in Bangladesh and both comprise of an upper and a lower poverty line. The Daily Caloric Intake (DCI) measure defines people consuming less than 2,122 Kcal per day as absolute poor and those consuming less than 1,805 Kcal per day as extreme poor (HIES 2010). The Cost of Basic Needs (CBN) measure defines people with per capita income between less than BDT 30 (urban) and 27 (rural) as absolute poor and those with per capita income less than BDT 25 (urban) and 23 (rural) as extreme poor (HIES 2005). HIES 2010 estimates suggest that approximately 17.6 percent of Bangladesh's population falls within the grips of extreme poverty, roughly 26 million people. Last week, MP Israfil Alam, Chairman, APPG on Extreme Poverty and also Chairman, Parliamentary Standing Committee on Labour and Employment Ministry, led a team of MPs from different political parties to the South to gain a better understanding of the challenges facing the extreme poor in their attempt to graduate out of poverty. MP Israfil Alam, MP S K Abu Baker, MP Nani Gopal Mondal and MP Anisul Islam Mandal, visited two NGOs - Uttaran and Save the Children, to explore how they can provide political support. The coastal belt in the South is a pocket of vulnerability with approximately 10 million extremely poor people living there. The area is prone to natural disasters such as floods, cyclones, tornadoes and tidal surges. In the past 100 years, 508 cyclones have affected the Bay of Bengal region (GOB, 2008), a situation exacerbated by the fact that Bangladesh is the most climatically vulnerable country in the world (IPCC, 2007). The extreme poor in this region suffer from a lack of fresh water (salinity problem), lack of income generating options (leading to urban migration), lack of access to basic services (health, water, sanitation), low levels of children attending school and limited access to social protection. They display a range of health problems with potential links to increased salinity exposure, including hypertension and miscarriage among pregnant women, skin diseases, acute respiratory infection and diarrhoeal diseases. 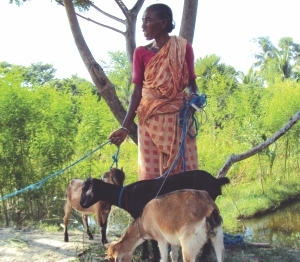 In this disaster-prone region, Save the Children's project aims to diversify the livelihood options of 15,000 households through asset transfers (mostly livestock), skill building, cash stipends, secured safety nets and market linkages. A key challenge these beneficiaries face is protecting their livelihoods from climatic disasters. For example, the tidal surge in October 2010 resulted in huge asset loss, but how could this have been prevented? Existing resilience measures were inadequate and support was needed to promote indigenous household methods of adaptation, community level approaches (social protection) and policy actions (to challenge the dominance of shrimp farmers, build more secure embankments, and address the issue of siltation build up in the rivers). Another issue the beneficiaries mentioned was the lack of regular access to vaccines for their livestock. Uttaran's project helps 12,000 extremely poor households lease khasland to cultivate for income and food security in Satkhira and Khulna districts. Uttaran also assists them with additional assets and skill transfers to help them make productive use of the khasland. Though khasland has been promised to the poorest by the government, attaining khasland is a lengthy and complicated process, involving multiple local government offices which often have little or no coordination with each other. The process itself requires a certain amount of education which does not fit the average profile of the people who apply for such land, and once the land is attained, making productive use of it is another challenge altogether. Uttaran has found that this challenge is even greater for female-headed households and those who receive particularly low-quality khasland. These issues were presented to the MPs. Local people urged the MPs to encourage the land administration offices in their areas to identify and distribute khasland to extremely poor citizens; to mobilise resources for water treatment stations, rain water harvesting and desalination plants; to mobilise resources for city corporations of Khulna and Satkhira to better deal with disasters to prevent urban migration, suffering and increased poverty; to stop the shrimp farming practice that reduces the fertility of land and so on. The MPs all mentioned that the households they visited were exceptionally poor (poorer than what they normally see in their constituencies) and that some successful cases had emerged as a result of the NGO work. The MPs assured their commitment in raising the profile of the extreme poor in parliament to mobilise additional resources and pro-poor policies. They encouraged researchers and NGOs to help highlight what some of these pro-poor policies may be. They mentioned the usefulness of the pro-poor pre-budget dialogue organised by shiree and BRAC in May and requested further such discussions. The Economic Empowerment of the Poorest (EEP) programme, better known by its approach - shiree – the Bangla word for steps (Stimulating Household Improvements Resulting in Economic Empowerment) is a partnership between UKaid from the Department of International Development and the Government of Bangladesh) that aims to challenge extreme poverty through suitable platforms and sustainable partnerships. One such platform, created in 2010 through the combined effort of shiree, the People's Empowerment Trust and the Government of Bangladesh, is the All Party Parliamentary Group on Extreme Poverty. This group, made up of 19 Members of Parliament, has committed itself to the goal of eradicating extreme poverty through government mobilisation and policy reform. To truly eradicate extreme poverty will require strong, joint efforts across Bangladesh. Kudos to the MPs for their support. We can only hope to see more such partnerships going forward. The writer is Head of Advocacy at shiree.